Lugging cumbersome photo gear when you are out and about usually involves a conventional camera bag with carrying handles or a backpack. The former requires finding a clean surface to rest your bag while you access your gear, while the latter requires taking the backpack off every time you need even the smallest item. 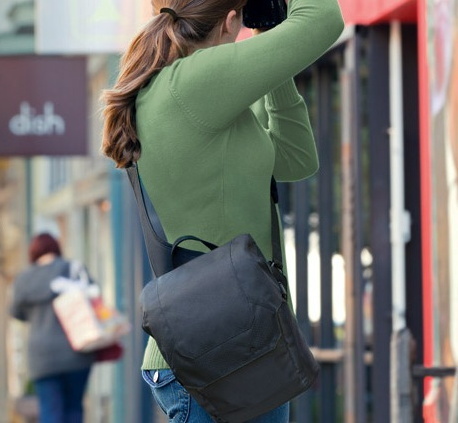 Lowepro has developed a unique solution that eliminates both of these inconveniences—the Urban Pro Sling. The bag is constructed with an across-the-body padded messenger bag strap that allows it to hang at your back while you are shooting, at your side or, when you need to grab an item, in front. There are currently two sizes available; the Sling 250 is the larger of the two. It can accommodate enough gear for a vacation, photo assignment, or short trip; for instance, a camera, two or three lenses, and a flash unit. In the back of the bag is a deep padded pocket that securely fits an iPad. The interior compartments are divided with the usual padded velcro panels that can easily be rearranged to accommodate most photo gear. The Urban Photo Sling 250 opens three ways. There is a zippered pocket on the front with compartments for small personal items, filters, tickets, and keys. It is protected from the elements by a weather-resistant flap that also conceals the larger zipper opening for the main part of the bag. If that zipper is opened around the top, your camera is immediately accessible. If the two side clips are released and the zippers are pulled down both sides, the entire contents are revealed. At the bottom there is a an elasticized mesh webbing that prevents items on the lowest level from inadvertently falling out. This is a thoughtfully designed bag. The exterior is plain, water-resistant black nylon without bold logos so it is not obvious that it contains expensive camera equipment. 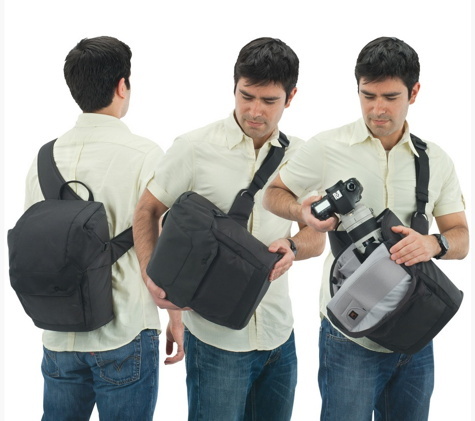 Most camera bags have black interiors making it difficult to find small items in the bottom. The interior of the Urban Photo Sling 250 is light gray that all but eliminates this annoyance. The exterior sides also have pockets. On the left is an expandable water bottle pocket that is a bit tight, but works in a pinch. The right side has a velcro-tabbed pocket that can hold credit cards or cash. 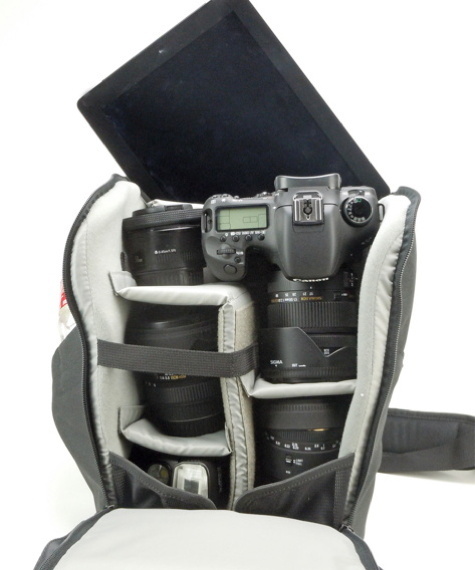 This is an excellent bag for the professional photographer or the weekend enthusiast. It’s lightweight, extremely well made, protects your gear, and excels in convenience.